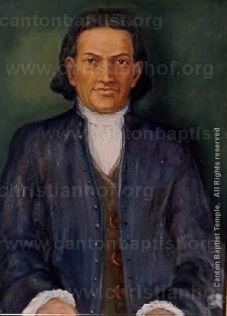 Alexander Mack is considered the founder of The Brethren Movement, oftentimes called The Tunker Movement because of insistence upon trine (threefold) immersion as the proper mode of baptism. Following careful study of scripture, Mack found himself out of harmony with the three state churches of Germany because of their formality, laxity in practice, and failure to observe all the New Testament teachings. In 1708, at Schwarzenau, Germany, with seven other like-minded persons, he organized a new denomination with a Christo-Bible- centered emphasis. Persecution caused flight from Germany by way of the Netherlands, they followed others of like faith to America in 1729. Germantown, Pennsylvania, became their American headquarters. This painting was authorized and produced by The Brethren Home Missions Council, Inc., Winona Lake, Indiana.